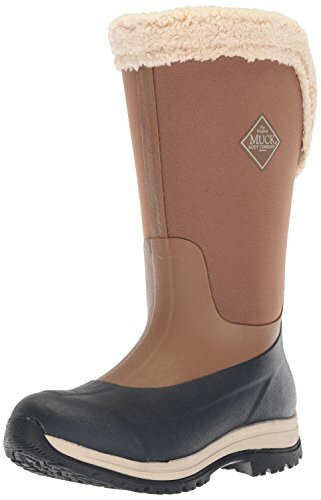 Comfortable and stylish, Muck Arctic Après Series Tall Rubber Women's Winter Boots are made from Muck's tough CR Flex-Foam neoprene. The special neoprene blend makes these women's snow boots 100% waterproof, with impressive flexibility to follow the movements and contours of your feet. These women’s winter boots have a rugged outsole to help you stay sure-footed on icy terrain. Lined with warm fleece, they are comfort rated down to -20 °F (-30 °C). The boots can also be rolled down to reveal cozy faux fur, a perfect complement to skinny jeans or leggings. Specially designed to fit a woman’s foot, these insulated boots are a versatile choice for everyday wear to and from work, home or the ski slopes.